Globe LIVE! 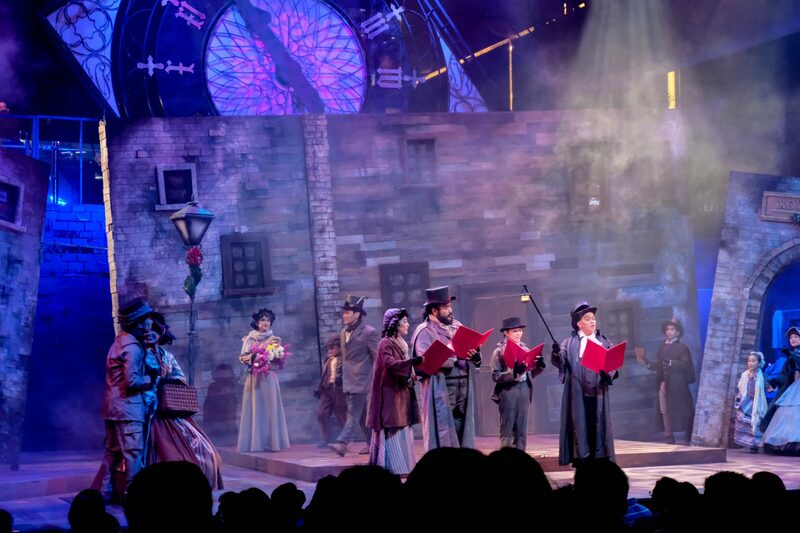 and 9 Works Theatrical brings back Alan Menken and Lynn Ahrens’ A Christmas Carol The Musical this December. This year’s re-staging features new stage, new cast and a new Tiny Tim among the many other surprises of this production. I’ve seen last year’s production and I must say, like the source material, it has become timeless. It never gets old and like a child who has longed for Christmas for 12 months, I don’t want it to end. 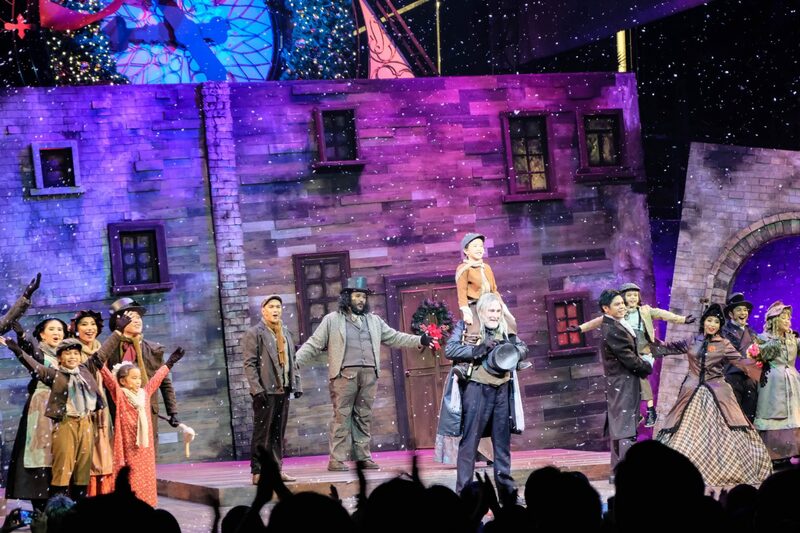 You know the story of Ebenezer Scrooge (Miguel Faustmann): an old, miserable and selfish man who hates Christmas. He rains on everyone’s parade when everyone else just wants to celebrate and have fun. Then one night, the ghost of his late business partner Jacob Marley (Noel Rayos) warns him to change his ways before it is too late. He tells Scrooge that three spirits would be visiting him to show how his life was, is and will be at Christmas time. Only then would Scrooge realize the true meaning of the holidays: love and family. Overall, this year’s production is on a whole new level. The new stage design (which is notably more traditional than last year’s t-shaped stage) set expectations high. I love the crooked buildings that were meticulously designed to illusion depth and continuity. Each panel had its own door/passageway that allows characters (and body doubles) to effortlessly sashay from stage right to stage left. Sometimes, I find myself mouthing Wow during transitions. You can’t also miss the giant clock that literally strikes an hour as each ghost visits Mr. Scrooge. 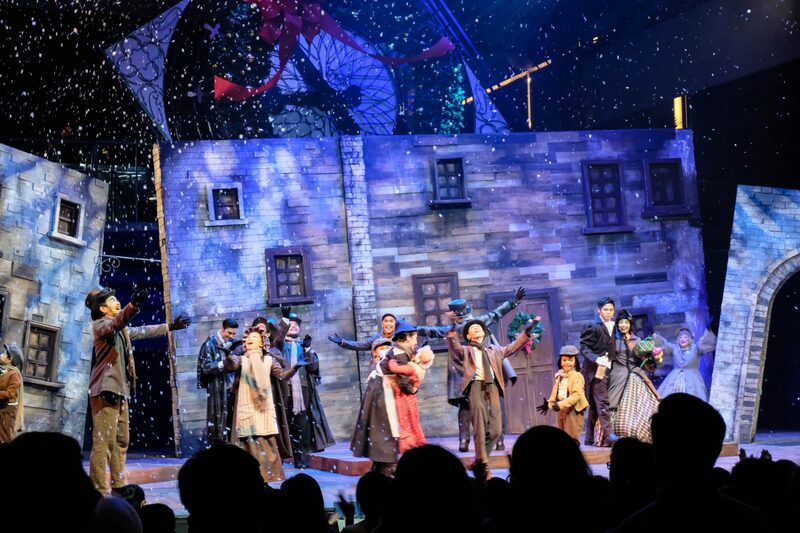 For me, the stage design contributes a lot in reinventing the musical and making it different and better than before. Spoiler alert: the clock transforms into a giant Christmas wreath at the end! The new cast members also bring something different to the show. Noel Rayos is a standout (whether or not he is on a unicycle). I last saw him in La Cage as the maid Jacob and amusingly, he plays a character with the same name in A Christmas Carol. 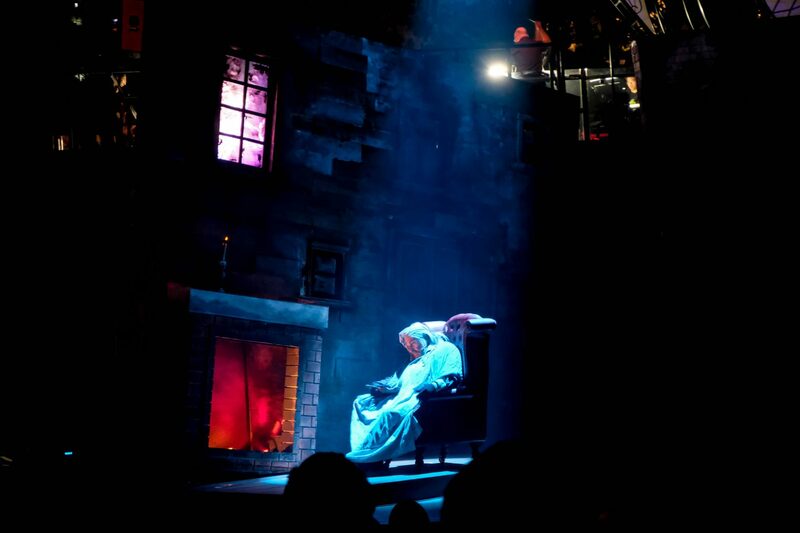 He gives an impactful job as Jacob Marley’s ghost giving the role the right amount of wit and creepiness. The very talented actors from Globe LIVE! and 9 Works’ last production, Newsies, also join the cast in lead and supporting roles. 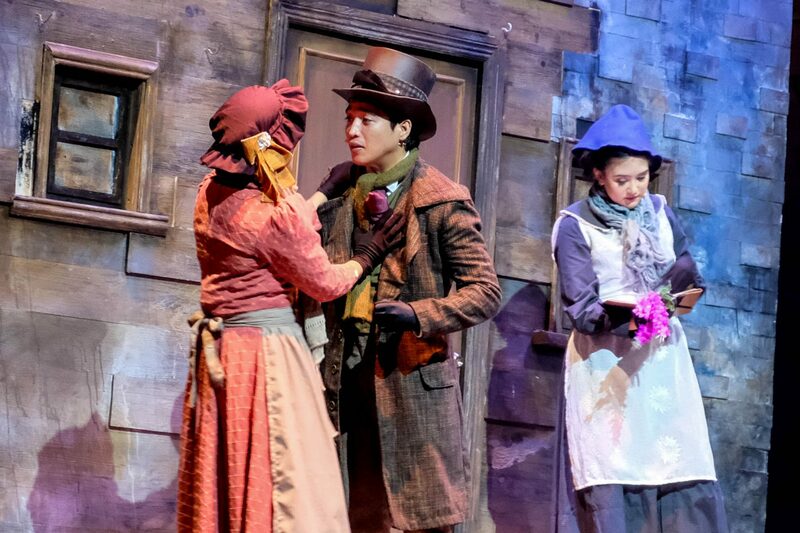 Jon Abella is a revelation as Bob Cratchit. 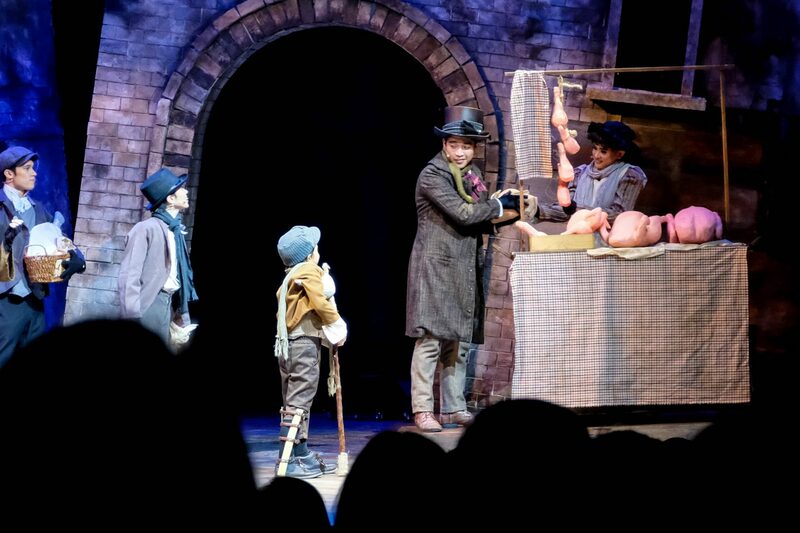 He gives a rather young-dad version of the role, making Mr. Cratchit very relatable to younger audiences (i.e. broke yuppies 😅). He and the other newsies like MC Dela Cruz and Kendrick Ibasco, are all standouts especially during Mr. Fezziwig’s Annual Christmas Ball (my favorite!). Side note: The tap dance number is the best I’ve seen so far since La Cage and Newsies. 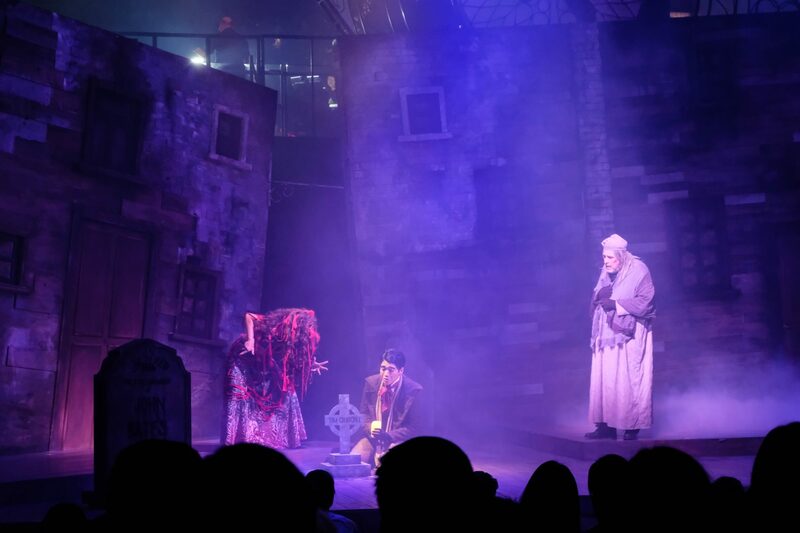 The musical also has different actors taking the roles of the three iconic ghosts: Franco Laurel, Nico Dans and Riseey Reyes played Ghost of Christmas Past, Present and Future, respectively. Seasoned theater actor Franco Laurel is effortless as Ghost of Christmas Past. His voice is perfect for the role. I also love how he gives the role a touch of comedy. He gives the audience a good laugh at the end of his number. Nico Dans’ stage presence is tested when his mic encounters a problem. He overcomes this and gives a powerful performance. Speaking of powerful, Hi-5 Philippines alumna Rissey Reyes surprises as Ghost of Christmas Future. She speaks volumes with her moves. God bless you, Tiny Tim! I’m sure everyone in the audience will agree that Elai Estrella’s Tiny Tim has captured everyone’s heart. His portrayal of Tiny Tim is full of innocence and rawness that you can’t help but go aww each time he appears on stage. I’ve seen his alternate Jaime Yupangco during the press conference and I’m sure he will also do a great job. I wish I had their accents though. 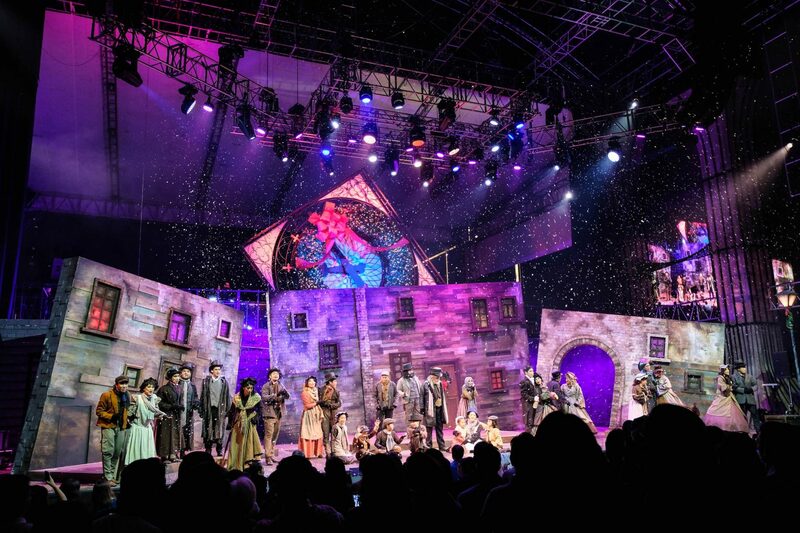 According to Globe LIVE!’s Joe Caliro, A Christmas Carol will be staged yearly to give Filipino’s a new family tradition especially on Christmas nights. He has a point. At least for my family, a traditional Filipino Christmas does not have specific activities by dawn. Last year’s Christmas night garnered 3,000 people. Maybe it can be our local version of Macy’s Thanksgiving parade. 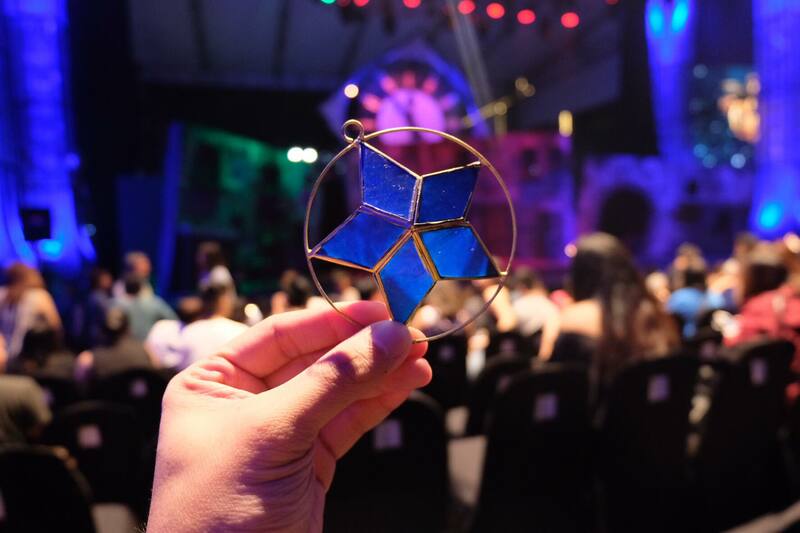 Likewise, it can also be an annual tradition for Filipino thespians. Miguel Faustmann reprises his role as Ebenezer Scrooge this year. He was and is still the perfect Scrooge. Playing Scrooge could become his own panata every Christmas season. The musical is also a good venue to spot new, young and raw talent. It has been introducing us to child actors that are not only so cute but are very talented too. More importantly, you can feel that the children (as well as the other cast members) love and enjoy being on the A Christmas Carol stage. Since I’ve already seen A Christmas Carol last year, I figured it won’t affect me as much seeing it again this year. I was wrong. Director, Robbie Guevara lived up to his promise that everything will be new except the book, music and lyrics (and some of the cast members, of course). So much of the musical has changed that it’s like seeing the musical for the first time again. Everyone of all ages will definitely enjoy A Christmas Carol. 2017 was a rough year and some of us may have lost our Christmas spirit. Watch it and find the miracle within you. 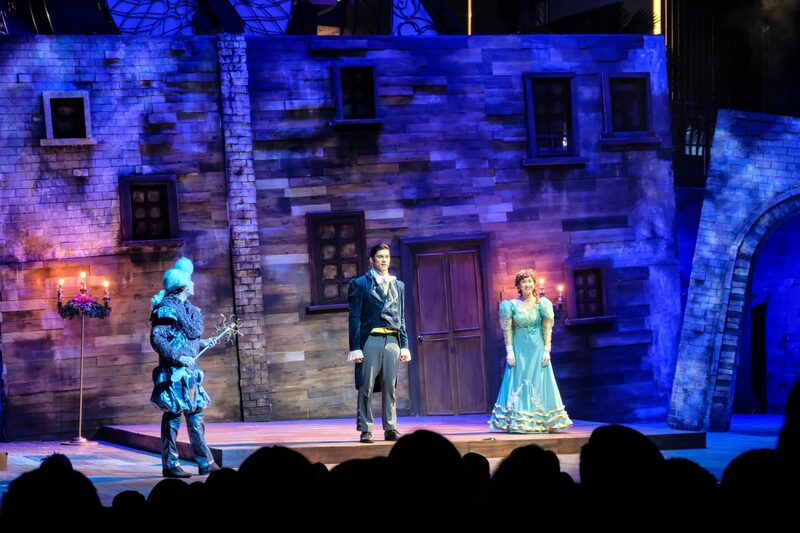 This year, A Christmas Carol ties up with Hero Foundation. By purchasing a Christmas ornament, we can contributing to help the families of our fallen soldiers. 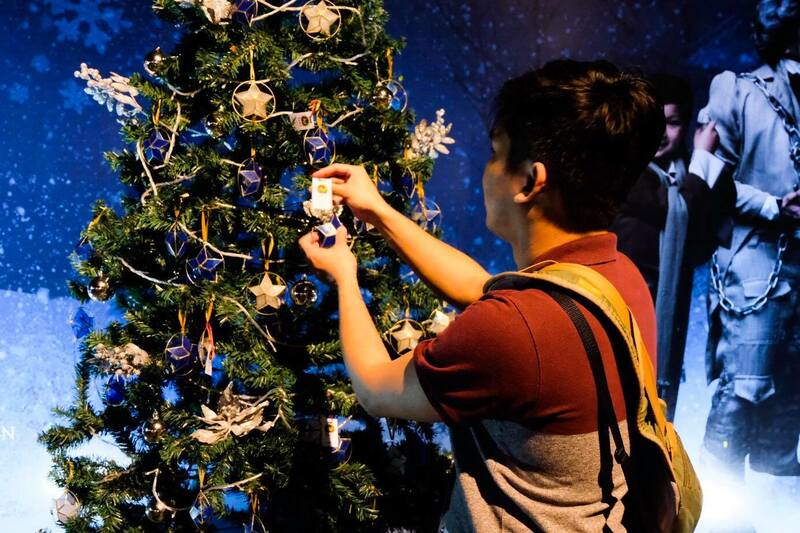 Buy a Christmas star for just Php 200 and hang them on the Christmas trees at the “Wall of Miracles” at the back of the theater. 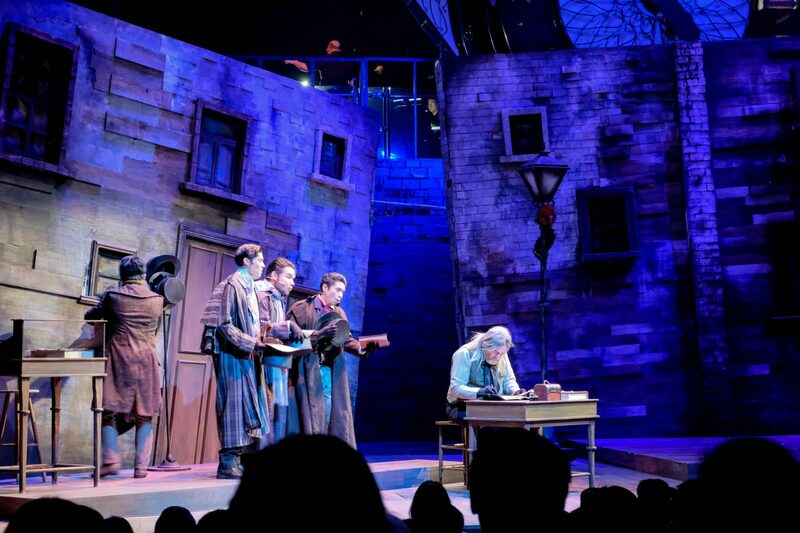 A Christmas Carol is directed by Robbie Guevara and will run at the Globe Iconic Store, Bonifacio High Street Amphitheater, Bonifacio Global City, Taguig on December 7-9, 14-16, 21-22 & 26-27 at 8:00 p.m, December 10 & 17 (Sundays) and December 25 (Christmas Day) at 7:00 p.m.